What’s the dream of every young rugby player? Well, most people would probably say it’s to take part in training with the best coaches in the land, and experience what life really is like for a professional rugby player. Most young players might dream about it, but few actually get the chance to experience it and live the dream. However, the opportunity of a lifetime was given to two young Macclesfield Rugby Club Under 16s second row players – Sam Worthington and Jack Hudson, courtesy of new Macclesfield Rugby Club sponsor, Halliwell Jones. Thanks to the generosity of Halliwell Jones these young players and family members were able to spend the day training with England Head Coach Stuart Lancaster and skills coaches Graham Rowntree and Mike Catt at the BMW Ultimate Performance Event in Nottingham earlier this month. 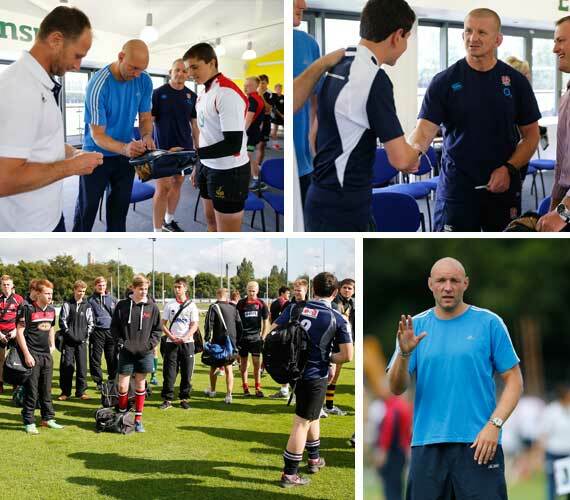 The BMW Ultimate Performance Events originally started in September, 2012, when BMW and the RFU announced a ground-breaking four year partnership to help develop the next generation of English rugby talent through the BMW Performance Academy. The philosophy behind the initiative was that by supporting players from the age of 15 through the journey to the senior squad, BMW could help to shape the future of England Rugby. The purpose of the BMW Performance Academy was to identify the key players of tomorrow and support their development, in order to ensure the future growth and sustainability of the national team. How were you and Jack chosen? How did you enjoy the experience? What do you think you learned from the experience, and what will you take away from the day?